Borders to begin liquidation as soon as this Friday, July 22. Sad that it's finally happened. Ebooks have made their mark. We have a special guest today! 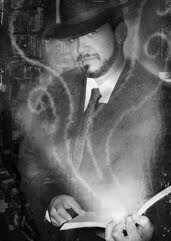 In our first Anthology Editor Interview, William H. Horner, Publisher and Editor in Chief, will share some of his experiences in publishing anthologies at Fantasist Enterprises. What is a Fantasist you ask? Fan • ta • sist [fan-tuh-sist] noun: 1. A person who writes or composes fantasies or fantasias in music, poetry, or the like 2. One that creates a fantasy. We are dedicated to reawakening the sense of wonder that our modern society can so easily suppress and disregard. We want our readers to recapture the wide-eyed glee they had as children, thinking that old trees contained spirits and clouds hid floating castles. We want them to study the shadows, trying to catch that strange movement they thought they saw, and experience visions that linger on the edges of their waking minds. We are dedicated to high-quality books that are impeccably edited. If you are a writer, we want to work with you to create the best possible version of your story that you can write. Our passion is storytelling, and we believe in exploring that passion with our authors. We will strive to help young authors to hone their craft, and we will push grizzled veterans of the publishing industry to go just a little farther. We are dedicated to fantastic art, and will do our best to fill our books with works of breathtaking beauty. So let the words and images take you. Sweet dreams, and fantastical visions! GPS: Why did you start Fantasist Enterprises? WHH: For a lot of reasons. Since then, I’ve discovered a knack for editing, something that I really enjoy. Helping authors hone their craft is a passion of mine. On the other hand, publishing, editing, and teaching have nearly consumed my writing life (and originally I had hoped those things could support my writing), but I’m trying to get back to it. GPS: You’ve edited many anthologies since starting Fantasist Enterprises. Which is your favorite? WHH: That’s like asking a parent to name his or her favorite child! I’m fond of different ones for different reasons. BASH DOWN THE DOOR AND SLICE OPEN THE BADGUY was simply a ton of fun to work on. MODERN MAGIC will always be close to my heart—there’s just something, well, magical about it. GPS: How do you arrange an anthology? WHH: They take shape as I’m finalizing the lineup. I can’t say that I have a specific technique. Based on the stories they contain, anthologies take on particular personalities. It’s all about figuring out the rhythm and flow of the thematic and stylistic threads that pull them together. Honestly, once you figure out the opening and closing stories, the rest sort of fall into place. GPS: Which was your most difficult Anthology to put together? WHH: They each come with their own sets of challenges. The first couple were difficult simply because I was just starting out. How little I knew then—but I always try to learn from each project so that the next one is even better. One of the anthologies that is currently in our pipeline, PAPER BLOSSOMS, SHARPENED STEEL, presented me with the difficult issue of rejecting several really wonderful stories simply because there wasn’t enough room for them all. The ones I had to say “no” to just didn’t quite fit the personality the book was taking on. GPS: How long does it take to produce an anthology from concept to complete? WHH: It varies depending on issues of available time and money. In Business 101 you learn that you can pick two of the following three attributes: fast, cheap, and high quality. I’m a stickler for quality and always strive to make the current book I am working on the best that I’ve put out. Since money has always been tight, you can figure out which two qualities I lean towards. I like 6-month open calls since it allows people time to work up new material or to tweak something they had previously completed. As submissions come in I attempt to read them as quickly as possible and send out rejections right away, or at least in staged batches. Ones that have potential go into ranked piles until the end of the submission period at which point I make final acceptance decisions. After the acceptances are handled (keeping in mind a two-month window for dealing with contracts), I prefer to have six to eight months to do editing work and art direction before sending out advanced review galleys. At that point the book should be three months away from publication. Pretty much everything is done in house, though I have no employees—just a handful of dedicated volunteers. No in-house artists, though. They are all freelancers. WHH: I’ve always loved short stories, and I believe that it is a powerful medium that deserves a renewed readership. From a business standpoint, in the early years I thought that having several excited authors would be better for promotion than one—but in practice there are very few authors who will get behind an anthology for the long haul and continue to promote it or carry copies with them to sell at conventions. That’s totally understandable, though: they simply don’t have as much invested in an anthology as they would in their own novels. GPS: What is the worst project-gone-wrong situation you’ve had? WHH: I’m still attempting to dig out from that one. A few years back I was paying advances at pro rates, which for anthologies means large advances for a small press. And I attempted to launch a comic book line. At the time, it looked as if things were really picking up, so it seemed to be good timing to start up some new ventures. Then the economy tanked and my personal finances took a hit. So basically, I ran out of money before we could get enough issues of the comics in the can to move forward, and my debt piled up. That has had a serious chain reaction on our publication schedule, so we’ve been facing painful delays. At this point, we’re working our way back up. We have our eyes set on completing the backlog of material that we need to publish, as well as on moving in some new directions—but we’re going forward at a more sustainable pace. I learned my lesson about overreaching. GPS: Are your books available in electronic format? WHH: Not yet: I’ve been in a wait-and-see mode. I’ve wanted to see what other people do with the technology so that I could learn from their successes and failures. Plus, the visual presentation is an important part of our books and I wanted to make sure that the technology was ready. It seems that a lot of publishers just slap text into an e-pub without really thinking through the plusses and minuses of the format. We want to be better than that. Lawrence C. Connolly’s VOICES will be our first electronic book (released along with the trade paperback). I’d like to get our backlist available, but that’s going to take time to secure the rights—there’s no way I’m going to just assume that it’s OK and utilize rights that I was not granted. GPS: What are your up and coming projects? WHH: I mentioned Lawrence C. Connolly’s VOICES, which is a collection of his horror stories from the past 30 years. It will contain essays that discuss the writing of the stories as well as Connolly’s inspirations—and some phenomenal artwork by World-Fantasy-award-nominated artist Jason Zerrillo. We’re also in the middle of a major re-branding initiative, the first phase of which involves a ground-up reconstruction of our website. Be sure to check the FE site in a couple of weeks for that. We have three anthologies for which stories have been accepted: FANTASTICAL VISIONS V (a non-themed fantasy anthology), BLOOD & DEVOTION II: MORE TALES OF EPIC FANTASY, and PAPER BLOSSOMS, SHARPENED STEEL: TALES OF FAR-EASTERN FANTASY. Finally, we’re also in the planning stages for our online magazine, SpecFic.net. GPS: Anything else you’d like to share? WHH: It’s something you do because you love it. I wouldn’t recommend it as something to do since it seems like an easy business—because it’s not! I’ve heard it said that you’ve got to be a little crazy to be a publisher, and I think that’s true. William enjoys working with authors, artists, and designers in all genres and media. A desire for discourse with creative individuals fuels his desire to be a freelance editor and designer. A student of Tai Chi Chuan and Haidong Gumdo, a Korean sword art that is relatively new in the United States, William strives to maintain a balance between physical, spiritual, and mental disciplines in order to excel at all of them. His other interests include history and archeology. Eras and cultures of particular interest include World War II, Roman and Medieval Europe and Britain, as well as Egyptian and Mayan / Aztec cultures. William has been known to enjoy singing karaoke on occasion. He is also the founder and director of The First Writes, a writing group based in Wilmington, DE. It’s been a long time since I’ve read a book this old. And this book has been on my to-read list for a long time. A mentor in my MA program suggested I read some Robert E. Howard and so I got this book but I never quite got to it. The Hour of the Dragon is Howard’s only novel-length story--the mass market paperback wasn’t even 300 pages. It was featured in installments in Weird Tales starting in 1935. Magic and betrayal, wizards, death and quests what’s not to love about this original sword and sorcery story? While Howard had great stories to tell, I found myself cringing at the usage and style. Exclamation points everywhere, ill-placed Middle English, impossible names (yet not as impossible as his contemporary and friend H. P. Lovecraft). Every time I cringed, I had to remind myself how long ago this was written. Have tastes in prose changed so much? Or was that just the result of the cheaply produced pulps of the era? Despite all that, delicious vocabulary crept among the purple prose on which 90’s Sword and Sorcery was built. It’s been a long time since I’ve had to look up a word while reading, and I think it’s a shame that I don’t have to do so more often. Maybe I’m just not reading the right stuff? What about Conan himself? The character that people could not get enough of in his heyday? I can certainly see the draw to him. He was the strapping giant that no one could beat, he fought on the side of good and didn’t back down from confrontation. Despite being a little sexist by my own 21st century standards, he had respectable morals and philosophies. He also was intelligent. He had a mind for politics, even though he obviously hated them, and could strategize a battle--and Howard could write it well enough to draw out the suspense (this is probably the key to his success). As I mentioned before, Howard created the original Conan character during the Great Depression. And now, the new movie for Conan the Barbarian is coming out, during this new depression we’re living through. Coincidence? What do you think? It's apparent by the results that word of mouth is a HUGE factor in deciding what books to buy. Having a good browsing experience to find new stuff becomes important in such cases, since once you find the book, you are likely to want to find similar stuff. Favorite feature of the ereaders? Portability across the board. Having a library at your fingertips, handy for when you want to have a few books available while you are traveling, and don't want to carry around bulky books in your carry on. In contrast, the least favorite features were the cost of the ebooks, the lack of a backlight on the Kindle, and not being able to take the iPad in the sun. Another problem mentioned was the fact that ebook readers are much easier to break than paperbacks. 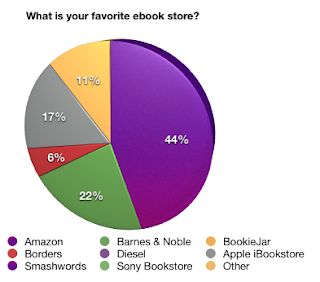 It's interesting to see that once an ereader has been purchased, people tend to stick with its built-in book store. It is hard to get anything other then Kindle books on a Kindle, and it has such a huge selection it makes sense to buy from them. The iPad can swing both ways. Well, more than that. Every reading format is supported. With programs like Calibre, it makes it easier to buy any format, then convert to the format of your choice. I also like when a company's like Smashwords and O'Reilly offer the book in multiple formats. So you are free to grab the version of your choice. So that about summarizes things up. Our thanks to the many that participated.